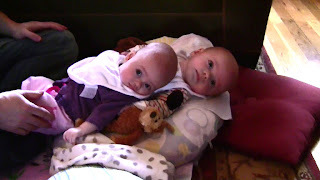 Boston Twins: Four Months Old! The twins are 4 months old today! Colin has full control of his neck and Ava is getting there. They CAN sleep for a 10 hour stretch at night - although most nights Colin wakes up once and can be put down with a quickie breastfeed. We purchased a Marpac white noise machine that seems to help them sleep longer and settle them when they do wake. Yesterday they both were trying to eat 6 ounces at a feeding - which proved to be a bit too much for them, but it's a good sign! They were both up over 25ozs total for the day yesterday! They are both becoming serious nappers too. It literally happened overnight with Colin in the crib with his mobile and Ava in the Pack n Play (in a different room) since they sometimes nap for different lengths of time. But they both seem to log in about 4 hours a day for naps. what a cute video you put togther! i wish we had videoed the delivery. Twenty five ounces - that's amazing! Once they get over 30 it is time to start thinking about introducing solids. And so smart to have them nap separately - I am a big fan of that since kids have different nap cycles. I can't watch the video at work but will when I get home.